Jake Hastie's double helped Motherwell move level on points with Livingston in the Scottish Premiership after beating the Lions 3-0 at a freezing Fir Park on Saturday, writes Craig Goldthorp. Motherwell's fourth consecutive league win was sealed with a three-goal glut within the opening 20 minutes. 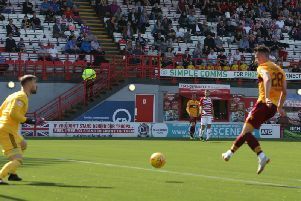 They took a sensational sixth minute lead in the Fir Park sunshine when Hastie headed in David Turnbull's whipped free-kick from the left flank. And the Steelmen went two up on 11 minutes when Curtis Main scored his first home league goal of the season when he superbly lobbed the ball over keeper Liam Kelly and into the net after Allan Campbell's through pass. Livi could have pulled a goal back within a minute when Scott Tiffoney's cross from the left was turned towards his own goal by home defender Richard Tait but keeper Mark Gillespie made a brilliant save to keep the ball out. And the Lions' Craig Sibbald then sent a low shot just beyond the right post as the visitors asserted their authority. Motherwell's tricky winger Gboly Ariyibi was having a stunning first half and he beat two men before blazing over the bar on 18 minutes. And incredibly it was soon 3-0 for the hosts when Hastie sprinted through and rifled the ball low into the net for his second goal of the game. Motherwell came close to a fourth goal on 27 minutes when Turnbull and Tait set up Ariyibi for a shot deflected wide for a corner. After such a thrilling start to the match, there was a lull before Livi's Steven Lawless fired a snap shot over the bar. Play then raged to the other end where defender Declan Gallagher's mistake was pounced on by the ever alert Hastie whose shot was blocked. After a spot of pinball in the Motherwell penalty area, the ball broke to Lawless but he struck a great chance wide from eight yards. Early in the second half, Ariyibi was booked for diving in the Livingston penalty box by referee John Beaton. Turnbull, making his first appearance since signing a contract extension, then bludgeoned his way through on 56 minutes before shooting powerfully but Kelly saved. And Motherwell then came so close to adding a fourth when Hastie's brilliant burst forward set up Main, who passed to Campbell whose effort was blocked on the line. Hastie's follow-up effort was deflected just too high. Dolly Menga - one of Livingston's three half-time substitutions - produced plenty of trickery in the second period and his dangerous 78th minutes cross was sliced for a corner by home defender Charles Dunne. Tiffoney sent a fine 20-yard shot against the post on 89 minutes as Livi came so close to pulling a goal back late on. Menga then shot wildly over for the visitors. The last action saw sub Frear rob keeper Kelly late on but the custodian recovered to block the ball. Motherwell: Gillespie, Tait, Aldred, Campbell, Main (Scott 77), Ariyibi (Frear 72), Grimshaw, Dunne, Gorrin, Turnbull, Hastie (McCormack 80).